"If it harm none, do what you will." 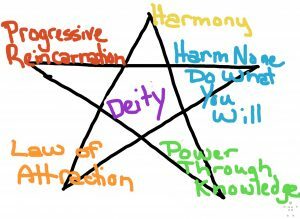 Harmony, Reincarnation, Power through Knowledge, Law of Attraction, and imagine that Deity exists in the center of your star. One can perceive rhythms in the patterns of the sun, moon, and seasons. It makes sense to learn those rhythms and to live in harmony with them. This can balance out our lives and help us identify our personal sense of harmony. Harmony and balance encourage to be neither too good nor too bad, but to find the balance in our lives. We define Reincarnation as an orderly system of learning through which a being progresses. This is not a tally of “sins” and punishments, nor is it a tally of good deeds. Compare human experiences to academic term papers, that is, a way of learning and improving. Power (energy) resides within each living creature. One can learn how to direct power. Whether energy or power feels “good” or “evil” depends upon the sender’s intention. In our more enlightened times (remember these tenets have been with us for many, many years), we like to say that this also means self-empowerment through knowledge. The place to grow and learn is, again, within you. The more wisdom (Wicca) you gain, the more you will find self-empowerment. What I do to other living creatures, I will draw to myself. Shakespeare called this Measure for Measure. It can also be expressed as “birds of a feather flock together.” We do not, however, ascribe to the commonly called Law of Three where what I do comes back to me threefold. We have had enough science in our backgrounds to trust that every action has an equal and opposite reaction. In the center of everything is the God-ess (This is our shorthand for the deity construct and should not be mistaken to mean a specifically female or male). Like Gravity, God-ess is impersonal. It treats everyone alike. It transcends gender and human emotions. Certain ideas cluster around the Deity. We, here, are syncretic monotheists.